Click here to see a review and photo gallery of ClancyWorks’ most recent assembly performance and workshop at Garrison Forrest School. There’s nothing like a live dance performance for students of all ages. 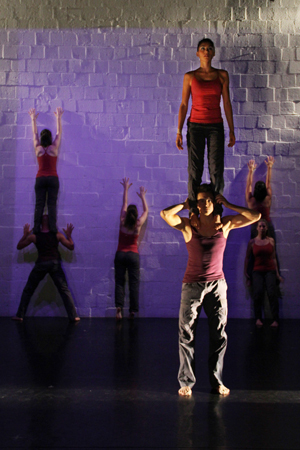 Dance performance is visually engaging and physically stimulating. It activates curiosity and shifts perceptions. In watching live dance performances, students gain greater understanding about themselves, their communities and their own potential. They leave a live dance performance inspired and engaged, ready to learn more. For K-12 school assemblies, ClancyWorks creates a program that excites students about the possibilities of dance to create community. The performance also exhibits the ways that a choreographer sees moments in everyday life and turns those moments into works of art. As company members of ClancyWorks, we have a diverse movement background, including contemporary modern dance and hip-hop mixed with traditional jazz. We perform dances that include versatile and visually exciting props and sets, along with our distinctive use of partnering in choreography. We strive to educate students about the importance of teamwork and collaboration through our performances. In particular, our unique partnering techniques demonstrate the ways that individuals can enhance their own abilities through a connection of mutual respect with a positive group of peers. ClancyWorks presents an assembly that highlights work tailored to specific age groups. In each assembly there is a mixture of group works, solos, duets and trios that engage students with fantastic partnering as well as a range of movement styles. We include a variety of audience participation opportunities, appropriate to each age group. Sometimes the dancers engage the student audience through dialogue and questions, other times through call and response exercises, or through leading a brief warm-up and creating a short dance with the students. Contact us today to arrange an assembly dance program, performed by the ClancyWorks Dance Company and featuring our distinctive, progressive partnering techniques and choreographies, for your school today! ClancyWorks staff can help your school identify grants and funding to make this assembly program possible.